Americans for Peace and Tolerance said today that Governor Patrick’s controversial visit to the Saudi-funded mega-mosque in Boston was sponsored by Islamic Relief, a group with longstanding terrorist connections and close ties to the Gaza Flotilla. On May 29th, APT released a video of the Governor’s May 22 visit to the Islamic Society of Boston Cultural Center in the Boston neighborhood of Roxbury. 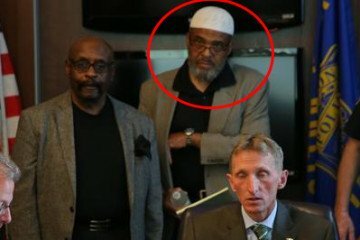 The video showed Patrick embracing Imam Abdullah Faarooq, who tells his followers to “pick up the gun and the sword.” Faarooq is a supporter of local terror suspects Aafia Siddiqui and Tarek Mehanna. Flyers distributed at the event revealed that the Governor’s visit was primarily sponsored by Islamic Relief. Islamic Relief is the founding member of the Union of Good (UOG), an umbrella of Hamas-funding charities. UOG is a designated by federal authorities as a terrorist entity, and is headed by Yusuf al Qaradawi, the spiritual head of the Muslim Brotherhood which gave birth to Hamas and Al Queda. Qaradawi was also an original Trustee of the Roxbury mosque. The Gaza Flotilla Link: The violent Turkish activists aboard the “Mavi Marmara” who attacked and attempted to lynch Israeli Navy commandos in Monday’s Gaza flotilla incident also belonged to a Union of Good member organization – the IHH, which is directly linked to Hamas fundraising. Islamic Relief also has an extensive history of aiding Hamas and other terrorist groups around the world. Jacobs indicated his concern that the $50K check might have come directly from Islamic Relief, which the Israeli government accuses of sponsoring Hamas. “It is incumbent on the Governor to immediately return the funds and investigate the source of this tainted money” said Jacobs.